In the good old days (post-1960, when I began gracing this planet), there were only trains if you wanted to go long distance. And reservations were difficult to get. But we did travel to many places, as my cousins, aunts and one uncle were spread far and wide, not to mention my mother's aunts and uncles. So it was that we covered Satna, Indore, Jabalpur, Jalgaon, Pune, Nagpur, Delhi (on way to a Kashmir holiday, no less, in 1978). Mostly it was in the summer, as that was the only time we kids had holidays. I don't remember the discomfort one bit, though. We also went to Haridwar and Rishikesh one time, and it was a memorable trip. Usually, our black and white camera rolls captured the pics before 1983, when colour first appeared in them. After we moved to Pune, my parents' anniversary. 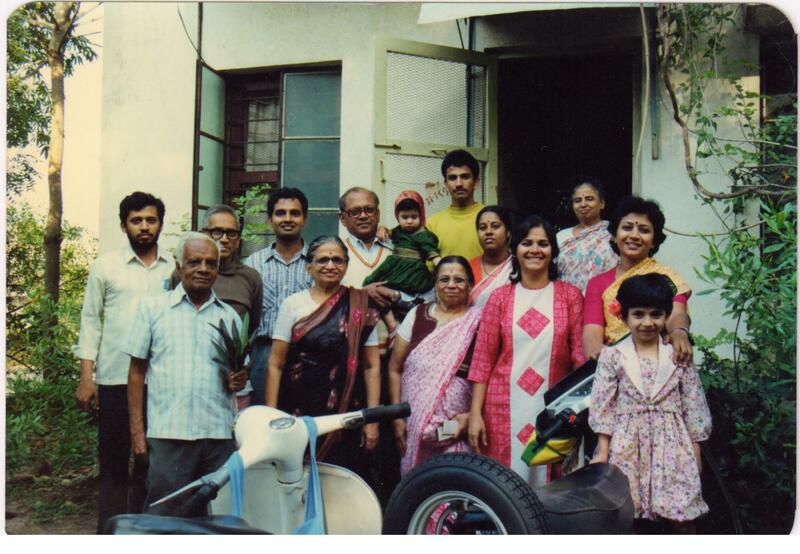 My great-aunt is in this one-we once visited her place near Baramati in a bus+bullock cart! One of the typical gatherings of relatives-this was in Patrakaar nagar, Pune. and this is a recent one at my Nagpur abode, with a cousin and hubby. Nagpur being in the centre of India, you can't avoid it wherever you travel by train. There were also trunks and hold-alls, because we travelled second class sleeper, and had to carry our own bed rolls in those. Stations on the way held fascination for the unique goodies they sold. I remember buying a basket of Oranges from Nagpur on one trip, and an earthen pot of gulabjamuns from Fatehabad or some such place near Indore or Ujjain. Both yummy. One summer on my internship, I travelled solo to the end of Assam from Tinsukia, and that was fun too. Doom Dooma and Margherita (I am not kidding) were some place names I remember, where I went in (Bajaj?) Matador shared taxis.